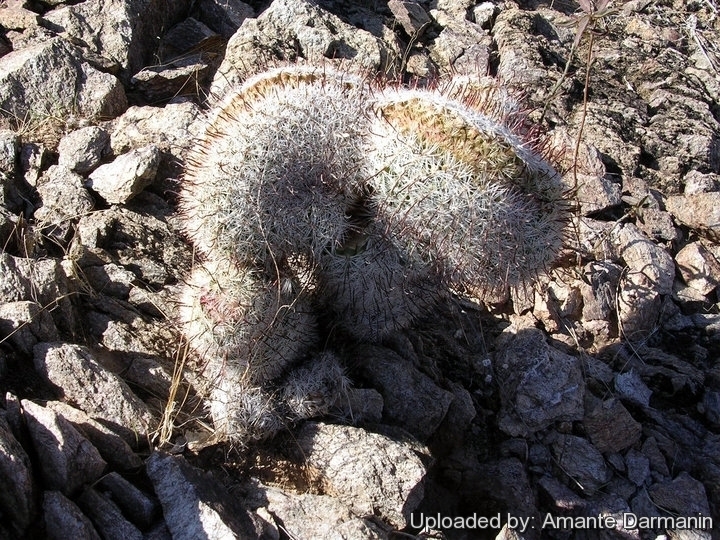 A naturally crested specimen in habitat at Sonoyta, Sonora, Mexico. Origin and Habitat: Crested form. The natural species grows in Southern USA (Texas, New Mexico, Utah, California and Arizona) and Mexico (Chihuahua Sinaloa, and Sonora). Description: Mammillaria microcarpa is a small solitary or clustering cactus with globose stems, the areoles with usually hooked central spines standing out perpendicular to the plant surface. This plant is generally known under the name of Mammillaria grahamii. Crested form: The beautiful and very rare crested form (Mammillaria microcarpa f. cristata) is sought after by specialized collectors and impassioned for its unique tufted appearance. It forms fan-shaped stems densely covered by hooked spines.